The City Line is a commuter railway line in Cardiff that runs between Radyr and Cardiff Central via Fairwater. The line was opened by the Taff Vale Railway in 1859, as part of its route from Radyr to the docks at Penarth. Subsequent construction by the TVR added links to Cardiff Central and to the Penarth Extension Railway by 1878. Originally the line was freight-only, but over the years saw regular use for empty passenger trains thanks to its links with the depot at Cardiff Canton TMD and also for football specials to Ninian Park stadium and periodic engineering diversions. British Rail started regular passenger services on this route in October 1987 with support from the Mid & South Glamorgan County Councils. Passenger trains run from Monday to Saturday. The line is also used as a diversionary route for trains serving Merthyr Tydfil, Aberdare and Treherbert when the line between Cardiff Queen Street and Radyr is closed for engineering work. In the past there were shuttle trains on the line to serve Pontypridd and beyond with one stop at Ninian Park. Services normally continue to Coryton via the Coryton Line. 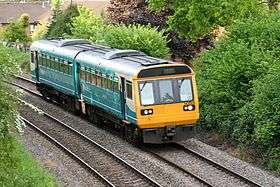 Arriva Trains Wales (ATW) currently operates the line as part of the former Valley Lines network. ATW succeeded the previous franchisee Wales & Borders in December 2003. Some freight services also use the line. ATW operates the line with diesel multiple units of Pacer classes 142 and 143 and Sprinter classes 150 and 153. The Pacers do not comply with the Disability Discrimination Act 1995 and so will have to be withdrawn by 2019. On 16 July 2012 plans the Department for Transport announced plans to electrify the line. This will require new electric multiple unit trains and should reduce journey times, operating costs and maintenance costs. The DfT intends the work to start between 2014 and 2019. The announcement was made as an extension of the electrification of the South Wales Main Line from Cardiff Central to Swansea and the electrification of the south Wales Valley Lines at a total cost of £350 million. This in turn is part of a £9.4 billion investment in railways in England and Wales. Wikimedia Commons has media related to Cardiff City Line. 1 2 "Rail electrification to Swansea and south Wales valleys welcomed". BBC Online. 16 July 2012. ↑ "£9bn railway investment announced by coalition". BBC Online. 16 July 2012.